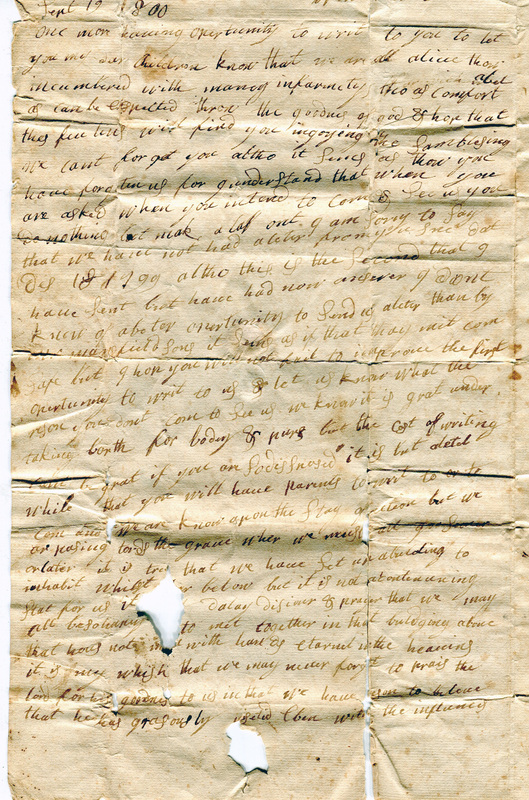 Letter dated 19 September 1800 written by Ebenezer and Elizabeth Brown of New Ipswich, New Hampshire to their son William and his wife Sally Brown of Camden, Maine. The letter was apparently hand-carried to Maine but possibly pre-dates postal markings. In this poignant letter, the parents upbraid their son for not writing or visiting in almost a year and beg him to do so soon before they die. There is an additional overleaf addendum within the letter dated September 21, 1800 from Ebenezer Brown to Isaac Brown (possibly another son of Ebenezer). Cursory research regarding the letter’s reference to “Mr. Mansfield’s sons” suggests that they were referring to Daniel Mansfield (1741-1816) who lived in New Ipswich and had several sons who resided in Camden. Ebenezer and Elizabeth Brown had a son Ebenezer (1769-1849) who married one of Mr. Mansfield’s daughters, Lydia Mansfield. Once more having opportunity to write to you to let you my dear children know that we are all alive though encumbered with many infirmities though as comfortable as can be expected through the goodness of God. I hope that this feeling will find you enjoying the same blessing. We can’t forget you although it seems as though you have forgotten us for I understand that when you are asked when you intend to come and see us you do nothing but [ILLEGIBLE]. I am sorry to say that we have not had a letter from you since last Dec 18, 1799 although this is the second that I have sent but have had no answer. I don’t know of a better opportunity to send us a letter than by Mr. Mansfield’s sons. It seems as if that they might come safe but I hope you will not fail to improve the first opportunity to write to us and let us know what the reason is you don’t come to see us. We know it is a great undertaking both for body & purse but the cost of writing can’t be great if you are so disposed. It is but a little while that you will have parents to write to or to come and see. We are now upon the stage of action but we are passing towards the grave where we must all go sooner or later. It is true that we have set up a building to inhabit whilst here below but it is not a continuing state for us. It [PAGE TORN] and prayer that we may all be so happy to meet together in that building above that [ILLEGIBLE] eternal in the heavens. It is my wish that we may never forget to praise the Lord for his goodness to us in that we have you [ILLEGIBLE] that he has graciously [PAGE TORN] with the influences of his Spirit in a [saving?] manner & that he has given up his name & not without giving up his heart also. We trust and wish that you might be steered up to rejoice with him for I am sure if you have a spark of saving grace in [ILLEGIBLE] you can’t help [ILLEGIBLE] at a distance but we hope that you will see him in this work & will rejoice together & that I will be so happy as to see it but more happy if we may spend a long eternity together where we shall have no fears of parting. I think there is [ILLEGIBLE] in him from what there [ILLEGIBLE] to be even in his common affairs & O that we might be more honest at the throne of grace for his holy Spirit to be poured out upon us, it would be happier living in the world if we could live nearer to the throne of grace. But as to your family, we want to know their present circumstances. We should be very glad to see them all if [ILLEGIBLE]. We do not know whether you have had another child or not. You have not taken pains to let us know but Mr. Mansfield’s sons say that Mr. Clark’s family intend to come up this winter. We will think it strange if you don’t come up with them but we don’t know which is the safest or the cheapest way. We wish that you may be directed for the best way you can find out. So no more at present but remain your loving parents till death. Below is page one of the original letter!